Due to their myriad of health benefits, mushrooms (particularly porcini mushrooms) are set to become 2018’s biggest superfood trend. In fact, we are predicted to spend more than £35 billion on mushrooms over the next seven years, and here’s why. A recent study found that mushrooms contain remarkably high amounts of two antioxidants: ergothioneine and glutathonine which are known to help fight signs of aging and boost your health. The mushrooms found to have the higher levels of these antioxidants were porcini mushrooms (which can be dried to preserve them). Mushrooms are also a great source of vitamins and minerals such as vitamin D, vitamin B, potassium, chloride, copper and selenium– all nutrients which are likely to be lacking in your diet. Not only can they help with anti- aging, but more and more evidence is showing that they can aid in weight loss. This is because they are low in calories and fat and they contain high amounts of plant- based protein as well as healthy fibre. The combination of all these characteristics is leading scientists to believe that they could be useful when it comes to losing weight. As a result of all these health benefits, mushrooms are appearing as an ingredient in more products such as skincare, vitamins/supplements and even coffee! Mushroom lattes are now being sold in coffee shops around the country and with good reason- these lattes are said to be filled to the brim with health benefits including immune boosing and anti- inflammatory properties! However; if this doesn’t appeal to you and you’d rather stick to your normal coffee, there are many Italian mushroom recipes that are tasty and cwill provide you with all the health benefits! Dried mushrooms are a very versatile product (100gr of dry product is equivalent to 1kg of fresh), you can keep them in your cupboard for a long time and when you are ready to use them just leave them in warm water for 15 minutes and they will be ready to cook. 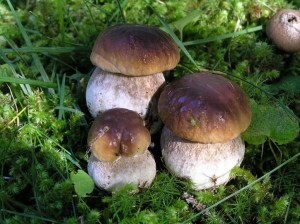 In Calabria, porcini mushrooms are a very popular product and from late August to October, it is common for locals to forage for them in the Sila or Aspromonte mountains. Place the mushrooms in a plate and add the parsley and lemon juice. Take a look at our online Italian food store for more inspiration for delicious, authentic Italian products.